There's definitely a few more that I missed, though. Ooooooh. Thank you! This helps a lot. Once I'm not braindead from LARP, I'll start sorting out a more solid write up of their conventions. Awesome! Get us all the names! Has anyone ever seen a female Granok name :/? 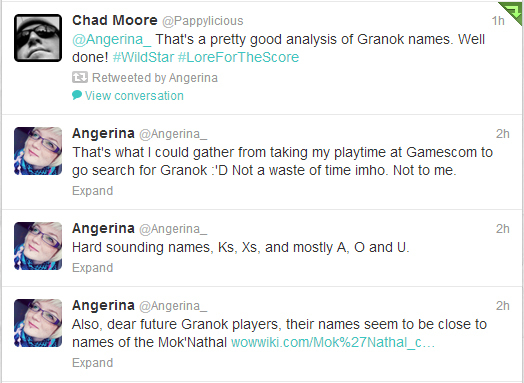 The only female name in game I could find was "Anxa", which gave me THE hint for the Mok'Nathal. I love that this is being added to!! Well DONE! Do we have any information yet on whether the game will, by default, allow for a last name? Or even a middle name and/or nickname? Perhaps Carbine has chosen to leave those sorts of things to the RP modding community instead? I would love to know all of the races naming conventions. Also if we can have spaces, underscores, periods in our names.